What Kind of Wood to Make a Mantel? 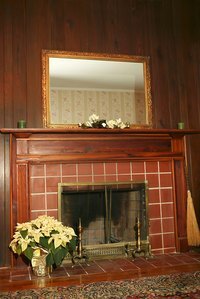 A thick, wooden mantel helps to add character to most fireplace styles. You can use several kinds of wood for a mantel, which can be in a number of styles. The wood should match or complement the home's other wood, especially the wood in the room with the fireplace. In most cases, hardwood is the best type of wood to use for mantels above fireplaces. Because of its hardness, it's durable and lasts for years while maintaining the appearance of newness. Although the color of the softwood cedar certainly can work with a variety of home decors, cedar is soft enough to become dented and scratched over time. That factor, however, makes using cedar appropriate if you wish to achieve a rustic look. The color of your fireplace mantel should suit the style of the room. The mantel doesn't have to match the room precisely, but it should complement the space. Light-colored woods are suitable in rooms with light walls and light accents. Pine is a light-colored wood that lends itself well to several decor styles. Red and white pine both work well, and both lighten slightly over time. Poplar is another common wood light in appearance. To keep the wood a light color, opt for either no stain or a clear stain. In the right setting, a dark mantel adds a degree of class and richness to a space. Dark woods include mahogany, cherry and walnut, and those woods are typically more expensive than their lighter counterparts. Dark woods range in color from nearly black to shades of deep brown and red. Using a light stain allows the rich color of the wood to show. Although staining a wood mantel is common, it's also possible to paint the mantel a color to suit the room. Painted mantels are best if their wood is low quality or has little character in the way of grain and knots. If you use pine, for example, which has little grain, painting it will not ruin its appearance. Paint it in a color that complements the room rather than using the same color as the room's walls. A bright color adds pizazz to a room. If you stain the wood, apply several coats of stain to give the wood a high-gloss sheen. What Type of Wood Can One Burn in Fireplaces?